APS Sentry maximizes your value from Microsoft APS. APS Sentry for Microsoft Analytics Platform System (APS) accelerates the return on your data analytics investment. APS Sentry helps you monitor and boost APS performance so you can deliver business-critical information quickly and easily. 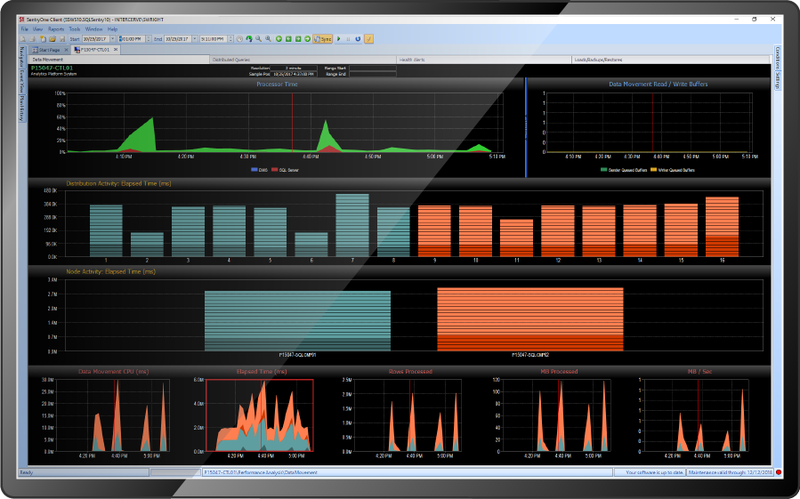 APS Sentry provides tools that help you identify inefficient data movement in Microsoft APS. The Event Calendar and Intelligent Data Movement dashboard help you identify factors that are affecting workloads. Intelligent alerting gives you complete control over notifications, so you always know what's happening in your APS environment. APS Sentry gives you visibility into the queries and jobs running to load, back up, or restore your data. With APS Sentry performance monitoring, you can be confident you're getting maximum value from your APS resources. Get details about any live or historical requests and the associated request steps across the APS environment. APS Sentry lets you set query collection thresholds based on duration, and displays the executed request, client, application, login, label, and resource class, along with pertinent performance metrics. View information about both in-process and historical events across your APS environment through the Loads, Backups, and Restores grid. Is APS Sentry for You? If you use Microsoft Analytics Platform System (APS), you need APS Sentry to ensure that you're getting the most value possible from your investment. Get APS Sentry and unleash the full power of Microsoft APS. Managing your Microsoft APS resources can be a challenge. It takes time to collect all of the relevant metrics from APS, correlate the information, and present it in a logical fashion. APS Sentry gives you everything you need in one place to optimize APS for more efficient performance—and dramatically increase your return on investment. With APS Sentry, you can unlock the true power of APS by optimizing the platform to deliver actionable, business-critical information quickly and easily. *License option requires year-one annual maintenance ($999) and provides technical support via e-mail and phone, software updates, and version upgrades. How many APS compute nodes to quote?